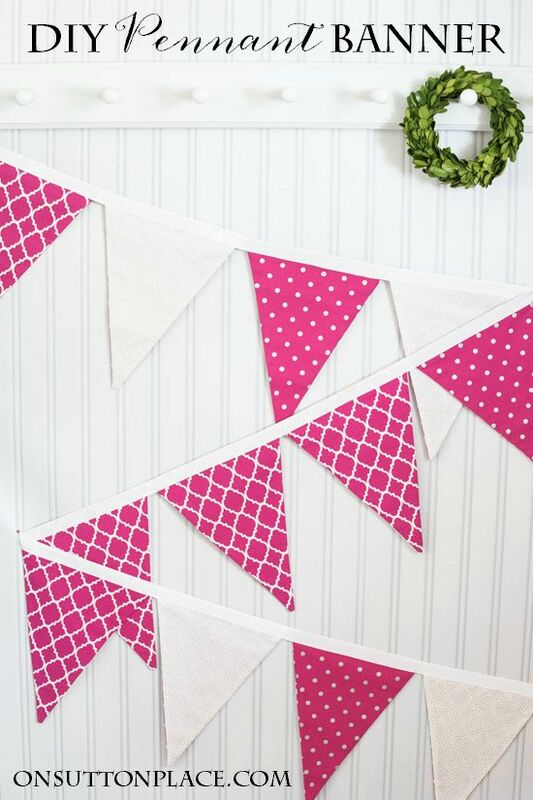 This DIY Pennant Banner Sewing Tutorial gives easy directions that show how to make a pennant banner. Photos and pennant template pattern included. Great for weddings, showers, & seasonal decor. The only thing better than giving a handmade gift, in my opinion, is receiving one. A handmade gift takes a little pre-planning and a little time. I don’t give handmade as often as I’d like because I’m not the best at thinking ahead. When I do pull it off and the project actually turns out, it’s like a tiny victory. OK…maybe not so tiny! That’s the story with this DIY pennant banner. I helped host a baby shower and wanted to make something for the baby’s nursery. 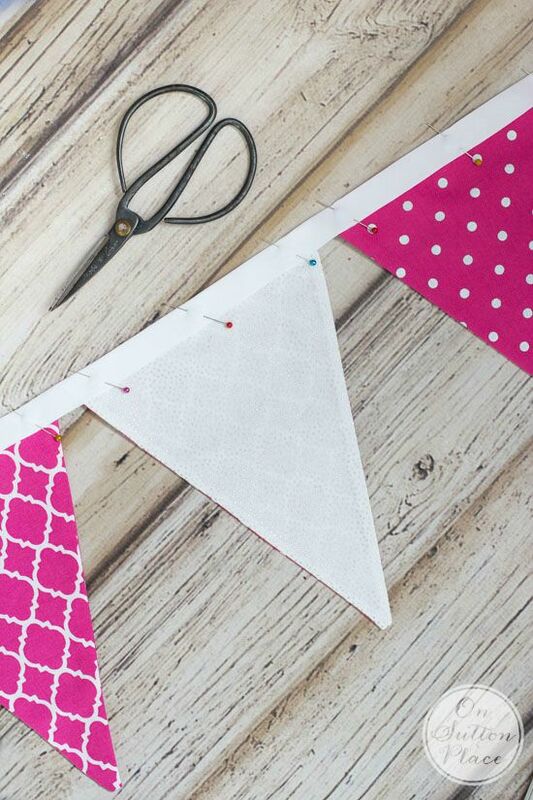 I’m going to show you how to make a pennant banner, but all you need are the most basic sewing skills. Nothing fancy required…and I’ve even included the pennant template pattern. basic sewing tools such as scissors, pins, iron, etc. First thing to do is make your template. To make the pennant template, I simply started with a sheet of paper. I used copy paper so it measured 8.5 x 11 in. 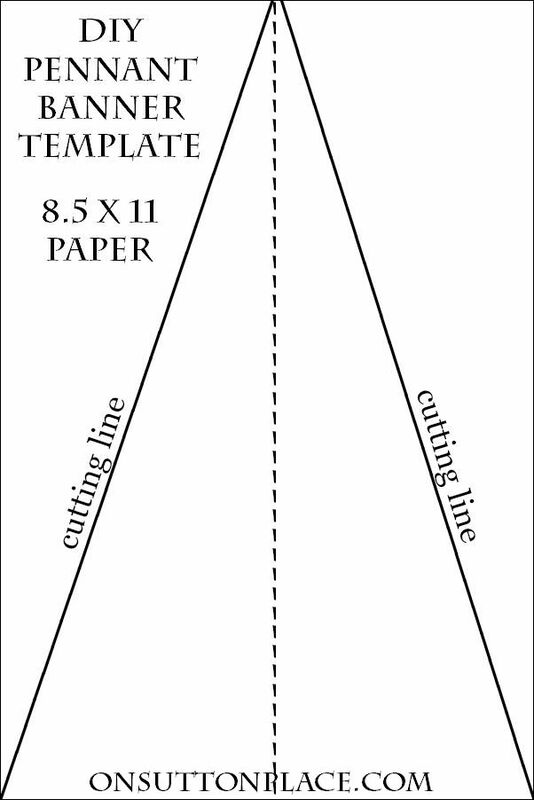 but any size paper would work…depending on how big you want your pennants. Fold your paper in half and then open it back up. Draw a line from the center point at the top to the left bottom corner. Repeat for the right bottom corner. Cut out the triangle. Now it’s time to cut out your pennants. Mix and match your fabrics any way you like. 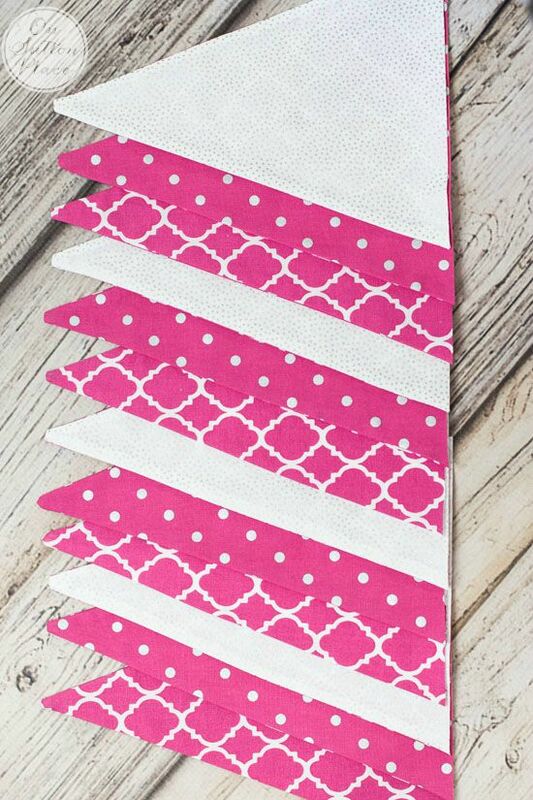 If you are using scraps, trace and cut out the pennants randomly. If you are using new fabric, cut them out like I have pictured in this post on making a no sew burlap banner. For this banner, I made 12 pennants so I needed 24 triangles. 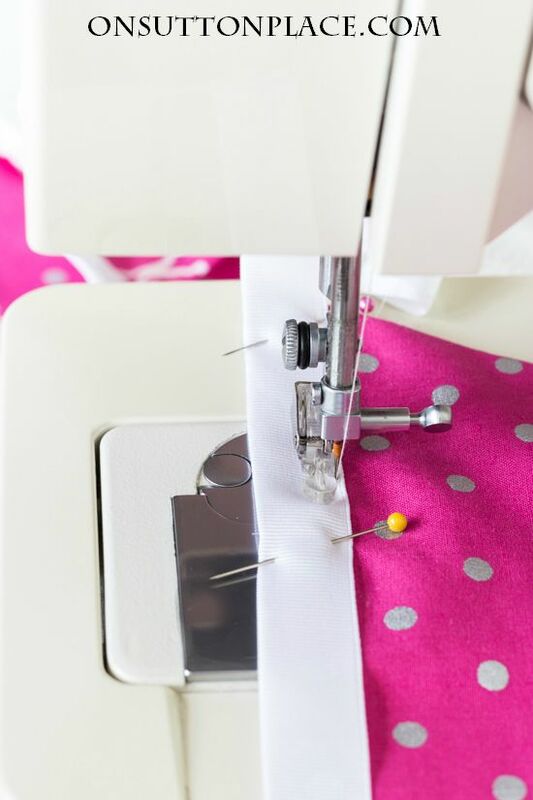 Once your pennant pieces are cut out, with right sides together and using your presser foot as a guide, sew two triangles together leaving the shortest side open. Repeat with the rest of your triangles. Turn each triangle and press well. Don’t worry too much about the points. They won’t be perfect but that’s OK. Remember this is handmade. To get them as pointy as possible, use a Dritz point turner or something similar. Just make sure the tool is not sharp. 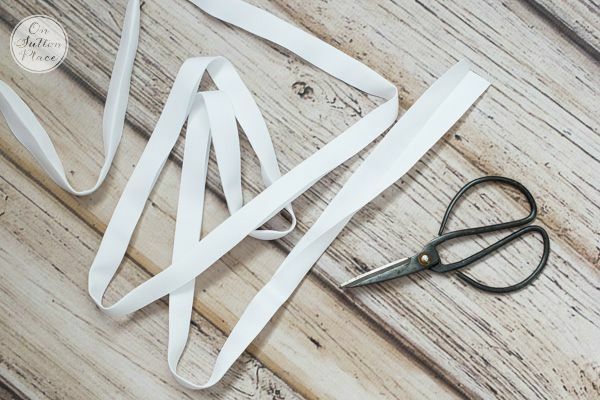 Cut a length of ribbon or bias tape as long as your banner plus 30 inches. That will leave about 15 inches on each end so the banner can be easily hung. If using ribbon, fold it in half length-wise and press well. Carefully place the open end of each triangle into the folded ribbon. (Make sure to leave the 15 in. on each end when you are placing your pennants.) Pin each pennant in about 3 places as pictured below. Using your machine’s zipper foot, sew along the edge of the ribbon so the pennants are firmly attached. By using your zipper foot, you will be able to get the needle to sew neatly along the ribbon edge. Remove the pins as you go and if needed, pull the ribbon taut to avoid tucks or wrinkles. 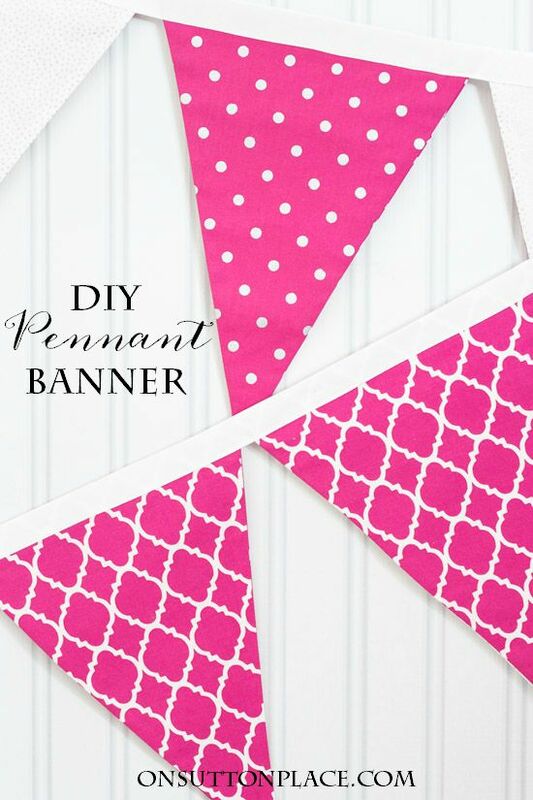 Give your DIY pennant banner one last press and that’s it! As I said, I made this pennant banner for a baby shower gift and used the fabrics featured in the new baby’s nursery. This is a great way to use up scraps. Another option is to get coordinating fat quarter bundles. This DIY pennant banner sewing tutorial can also be used if you want to make a reversible banner. There is something charming and fun about banners. If you don’t think they go with your style, add a seasonal banner. There are numerous ways to hang them and any size is possible. They look so nice on a mantel or above an open doorway. If you don’t sew, never fear. I’ve got you covered! Click the links below for a few no sew banner options. As always, let me know if you have any questions. I hope the sun is shining where you are and that your day is beautiful. See you soon! That turned out so cute, and will be an adorable addition to the baby’s room! I also made a banner for a baby shower I hosted, but took a simpler approach. I used fusible webbing with the material that matched the baby’s bumper and sheets. That allowed me to use pinking shears to cut the penant rather than sewing the penant flags. I followed up with the bias tape, just as you did. The mother-to-be loved it and it’s still hanging in the baby’s room! Have a wonderful weekend! I have been thinking sewing a banner(s), but couldn’t seem to get around to actually drawing up a plan! Thank you so much for this; straightforward, simple and fun to do! You did a sewing post a while ago on sewing tools; I ran out that day and bought scissors and a Dritz point turner solely based on your recommendation! 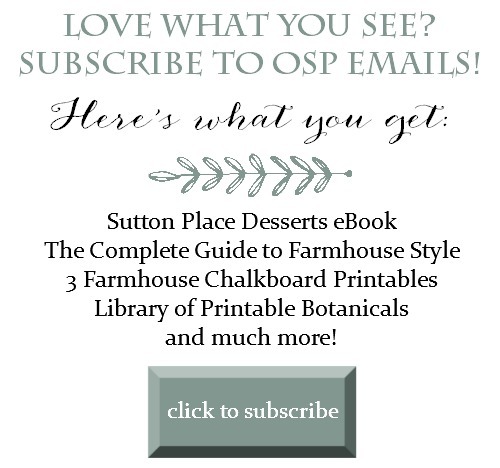 Your sewing posts are my favorite, but your whole blog is wonderful! How cute Ann, I have making one on my to do list, but it seems the list is longer and my time is shorter. There’s such pretty fabric choices out there, it will be hard to decide. So pretty! I want to get back to doing some small sewing projects. Thanks so much for this little inspiration project. Not too big to tackle for busy women like us! Love this!! Adorable! This just might inspire me to dust off my sewing machine and do something with it! I am new to your blog, having found you through a page I follow on Facebook. My daughter is getting married in October, and I am helping host her bridal shower in August. As a total non-sewer, I appreciate the link to the no-sew burlap banner. It is really pretty and will definitely fit with my daughter’s rustic/vintage wedding style, so I am going to attempt making one. Not sure how it will go, as I am majorly challenged in the arts department. Thanks so much for sharing the how-to! I really love this idea. I sew and have lots of bias tape, so off I’ll go!! !